The Yankees announced Friday that they’ve signed right-hander Drew Hutchison to a minor league contract and invited him to Major League Spring Training. Outfielder Matt Lipka, too, will receive a minor league deal and a non-roster invite to Major League camp. Hutchison, 28, once looked like a promising long-term piece in the Blue Jays’ rotation, but Tommy John surgery threw a wrench into his outlook early in his career. The righty has bounced around the league over the past several seasons, most recently splitting the 2018 campaign with the Phillies and Rangers — throwing exactly 21 1/3 innings for each club. Hutchison was pummeled for a combined 6.75 ERA in that stretch and owns a lackluster 5.10 ERA in 460 1/3 MLB innings. However, he’s been vastly better in Triple-A, where he’s compiled a 3.58 ERA with 8.1 K/9, 3.2 BB/9 and 0.8 HR/9 in 362 1/3 innings. He’ll give the Yankees some depth in the rotation heading into camp this spring. Lipka, meanwhile, batted .240/.329/.359 as a 26-year-old in Double-A last season. A converted shortstop, Lipka has logged more than 4000 innings in center field since moving there in 2012 and brings some speed to the table, with 186 career stolen bases in 868 games. He stole 21 bags this past season, 25 in 2017 and topped out at 37 swipes back in 2013. Lipka has never hit for much power, though, and last season’s .329 OBP was his highest since a .335 mark in Class-A Advanced back in 2012. The Rangers have outrighted right-hander Drew Hutchison, per a club announcement. He has already cleared waivers and been assigned to Triple-A. Having created two 40-man roster openings, the Rangers will purchase the contracts of righty Adrian Sampson and lefty C.D. Pelham. Also coming onto the active MLB roster are right-hander Austin Bibens-Dirkx, outfielder Willie Calhoun, and infielder Hanser Alberto. Hutchison, 28, was signed onto the MLB roster recently as the Rangers sought to fill some innings. Unfortunately, he was unable to take advantage of the opportunity, surrendering 21 earned runs with an ugly 12:13 K/BB ratio in 21 1/3 innings over five starts. Despite generally excellent minor-league numbers, Hutchison has never really found success in the majors. In parts of five seasons in the bigs, he has thrown 460 1/3 total frames of 5.10 ERA ball. The Rangers and right-hander Drew Hutchison have agreed to a major league contract, according to an announcement from Texas. Hutchison, an ACES client, will start the Rangers’ game against the Orioles on Sunday. The Rangers are the third major league organization of 2018 for Hutchison, who inked a minors pact with the Phillies in February and did well enough in camp to earn a season-opening roster spot. The 27-year-old worked out of the Phillies’ bullpen, making 11 appearances and tossing 21 1/3 innings of 4.64 ERA ball, before the club designated him for assignment in late May. Hutchison, who went on to reject an outright assignment to Philly’s Triple-A affiliate, then caught on with the Dodgers on another minor league contract. He did not return to the majors with them, though, and after posting a terrific 2.14 ERA in 42 innings (nine appearances, seven starts) with their Triple-A club, opted out of his deal this past Tuesday in favor of free agency. Returning to the open market proved to be a wise move by Hutchison, who will now get a chance as part of a thin Rangers rotation. Texas, which is well out of contention, has seen its starters log the majors’ second-worst ERA (5.28) and third-worst fWAR (2.3) this season. Hutchison has generally been more successful than that at preventing runs, though he has only combined for three starts since 2017. He’s best known for his run with the Blue Jays from 2012-16 – a 76-appearance, 73-start stretch in which he put up a 4.92 ERA/4.23 FIP with 8.28 K/9, 2.84 BB/9 and a 38.7 percent groundball rate over 406 1/3 innings. Hutchison also racked up at least 150 frames in two individual seasons (2014-15) during that span. While Hutchison had his moments as a Blue Jay, he has fallen off the radar somewhat since they dealt him to the Pirates at the trade deadline in 2016. Hutchison wound up spending all of last season with the Pirates’ Triple-A affiliate. Now, Hutchison will get his best major league shot in a while, and if he performs well down the stretch, he could emerge as a multiyear find for Texas. The pitching-starved Rangers will have an opportunity to control Hutchison via arbitration for up to three years. Right-hander Drew Hutchison has opted out of his minor league contract with the Dodgers, tweets Bill Shaikin of the Los Angeles Times. The veteran right-hander, then, is a free agent and is now eligible to sign with any team. Hutchison, 27, began the season with the Phillies and pitched to a 4.64 ERA with a 19-to-13 K/BB in 21 1/3 innings of work before being designated for assignment and ultimately landing with the Dodgers. While he never made it to the big leagues in L.A., he pitched brilliantly with Triple-A Oklahoma City, logging a 2.14 ERA with 8.6 K/9 against 2.8 BB/9 in 42 innings at that level. More impressively, Shaikin notes that Hutchison snapped off a 23-inning scoreless streak to end his tenure with the organization. Understandably, after not being brought to the Majors on the heels of that type of success, Hutchison will re-enter the open market in hopes of finding a new opportunity with a clearer path to the big leagues. The right-hander has struggled to find his footing in the Majors over the past several years, but he looked like an intriguing long-term rotation piece with the Blue Jays back in 2013, when he pitched 184 2/3 innings of 4.48 ERA ball with a strikeout per inning, solid control and a 3.85 FIP. The Dodgers have signed right-hander Drew Hutchison to a minor league deal, according to Alex Freedman, a broadcaster for their Triple-A affiliate in Oklahoma City. Hutchison is likely to debut for OKC on Sunday, Freedman adds. Hutchison was previously with the Phillies, who inked him to a minors deal in the offseason. The 27-year-old did well enough in camp to earn a spot on the Phillies’ season-opening roster, but they ended up designating him for assignment in late May, and he then elected free agency. Hutchison came out of the bullpen during his Phillies tenure and pitched to a 4.64 ERA with 8.02 K/9, 5.48 BB/9 and a 50 percent groundball rate across 21 1/3 innings and 11 appearances. While Hutchison served as a reliever in Philadelphia, he’s best known for his tenure as a starter with the Blue Jays from 2012-16. During that 76-appearance, 73-start span, Hutchison tossed 406 1/3 innings of 4.92 ERA ball and notched 8.28 K/9 against 2.84 BB/9. Toronto shipped Hutchison to Pittsburgh in an August 2016 trade, and he hasn’t been much of a factor in the majors since. Now a member of the Dodgers, he’ll once again try to work his way back via the minors. Righty Drew Hutchison has elected free agency after clearing outright waivers, the Phillies announced today. He had been designated for assignment recently. Hutchison, 27, worked to a 4.64 ERA with 8.0 K/9 and 5.5 BB/9 over his 21 1/3 innings on the year. To be fair, much of the damage came in two long-relief appearances during a stretch in which he appeared just twice in a 26-day span. In parts of five seasons in the majors, Hutchison owns a 4.92 ERA with 8.3 K/9 against 3.0 BB/9 over 439 innings. He’ll surely have little trouble catching on somewhere, though it’s anyone’s guess when he’ll receive his next shot at the MLB level. The Phillies have designated catcher Cameron Rupp for assignment, per a team announcement. The club selected right-hander Drew Hutchison’s contract in a corresponding move. 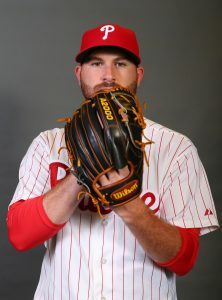 The 29-year-old Rupp has been a member of the Phillies since they chose him in the third round of the 2010 draft, and he debuted in the majors in 2013. Rupp has racked up 1,127 major league plate appearances since then, including 331 last year, when he hit .217/.299/.417 with 14 home runs. Overall, he has posted a .234/.298/.407 line. Defensively, Rupp has earned negative pitch-framing grades from Baseball Prospectus since 2015, when he began seeing significant playing time, and was especially poor in that department last season. On the other hand, he has thrown out 31 percent of would-be base stealers for his career, beating out the league-average mark (28 percent). Rupp’s designation makes it clear the Phillies will turn to Andrew Knapp to back up starting catcher Jorge Alfaro at the outset of the season. They could also try to find a taker for Rupp, who will make $2.05MM this season – his first of three arbitration years. Rupp has a pair of options remaining, so he could still function as minor league depth. Hutchison, who’s best known for his Blue Jays tenure from 2012-16, joined the Phillies on a minor league deal last month. That came after he spent all of 2017 with the Pirates’ Triple-A affiliate. Thanks in part to injuries to Jerad Eickhoff and Mark Leiter Jr., Hutchison may claim a spot in the Phillies’ season-opening rotation. The 27-year-old has made a strong case for one this spring, as he has allowed just six earned runs on 12 hits and eight walks, with 17 strikeouts, in 19 2/3 innings. The Phillies announced this morning that they’ve signed right-hander Drew Hutchison to a minor league contract with an invitation to Major League Spring Training. Hutchison, 27, once looked like a potential long-term rotation cog for the Blue Jays. After missing the entire 2013 season due to Tommy John surgery, Hutchison returned in 2014 to make 32 starts in Toronto, pitching to a 4.48 ERA with more impressive 9.0 K/9, 2.9 BB/9, 3.85 FIP and 3.59 SIERA marks. That solid performance came at just 23 years of age. However, Hutchison endured some significant struggles in an uneven 2015 season and finished out the year with an unsightly 5.57 ERA in 150 1/3 innings. While fielding-independent metrics felt there was some misfortune at play (he did sport a lofty .343 BABIP and an uncharacteristically low 64.5 percent strand rate), Hutchison saw his strikeout, swinging-strike and home run rates all trend in the wrong direction during that ugly 2015 season. Hutchison appeared sparingly in the Majors in 2016 and was ultimately traded from Toronto to Pittsburgh in the Francisco Liriano salary dump. While Hutchison seemed a reasonable buy-low piece for the Pirates in that swap, though, he never received much of an opportunity in the Majors despite posting quality numbers in Triple-A. Over the past two seasons at that level, Hutchison has tossed 297 1/3 innings of 3.57 ERA ball with 7.9 K/9, 3.2 BB/9 and 0.9 HR/9. With the Phillies, he’ll compete for a rotation spot behind staff leader Aaron Nola. Others in the rotation mix for the Phils include Jerad Eickhoff, Vince Velasquez, Nick Pivetta, Ben Lively, Jake Thompson, Zach Eflin and Mark Leiter Jr. — each of whom saw some time in the Major Leagues last season. Eickhoff and Velasquez are probably penciled in for rotation spots, health permitting, though neither turned in an especially impressive showing in 2017. Should Hutchison reestablish himself as a big league arm, the Phillies will have the added bonus of controlling him for up to three years via the arbitration process, as he’s currently sitting on three years, 165 days of Major League service time.